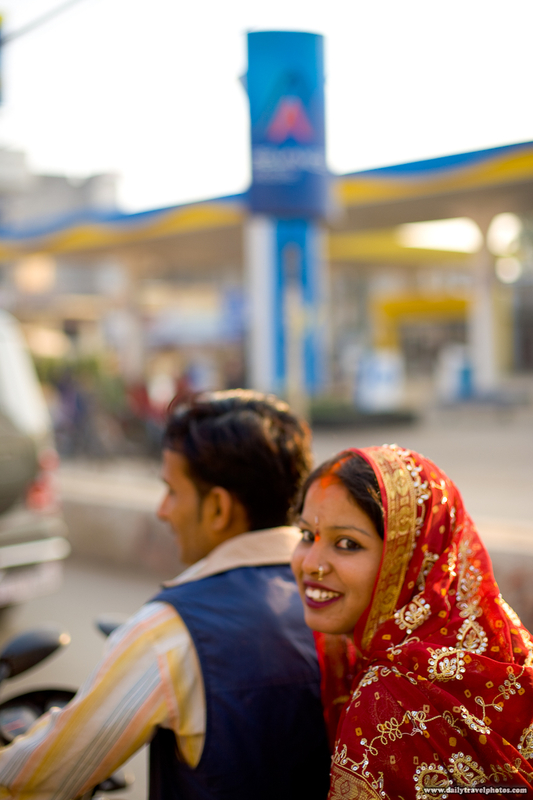 A momentary glance from a cute Indian bride as she rides pillion with her new husband (ARCHIVED PHOTO on the weekends - originally photographed 2008/01/26). They (on their motorcycle) zipped by me (on a cycle rickshaw) in a flash. In that fleeting moment, I didn't have the reflexes to compose or to get a proper focus lock. I snapped the photo anyway and despite its softness, I'm still rather fond of the image. I've heard it said before that a technically perfect image lacking emotion can never outshine a technically imperfect image with a sense of emotion. I believe that statement applies to this photo but in a perfect world, I would have nailed both elements perfectly. Cool, she looks really happy! @RedCat430, Here's a bit of backstory. After I took the picture, the 2 on the motorcycle (including "happy" bride) stopped and seemed angry/confused that some foreigner on a rickshaw took a picture of the bride. As I passed them in my cycle rickshaw, they were looking very hard at me. I gave them a smile and 'thank you' which completely disarmed them and they smiled in return... fortunately.